Nilai University’s 105-acre campus is conducive for tertiary studies. In 1998, with full infrastructure in place, the University opened its doors, offering homegrown diploma programmes in the areas of Business, Information Technology, Engineering and Hospitality. In addition, the University, as one of the first institutions approved to run 3+0 programmes, offered students an opportunity to be awarded internationally recognised degrees, without leaving Malaysian shores. The University’s dedication and commitment was given due recognition when it won the Malaysia External Trade Development Corporation (MATRADE) Industry Excellence Award (Services) in 2003. Nilai University, has been given a ranking of 5 or Excellent in the SETARA 2013 & 2011 by the Malaysian Qualifications Agency. Since the turn of the century, the University has developed other programmes rooted in traditional academic fields, as well as those innovative and new to the Malaysian academic landscape such as the Aircraft Maintenance and Automotive Engineering programmes. In addition to undergraduate programmes, the university has added a number of Master degree programmes to its offerings. The university has four air-conditioned auditorium-sized lecture theatres; two 250-seater and two 150-seater halls fully equipped with the latest teaching facilities. Nilai University has air-conditioned, AV-equipped classrooms and tutorial rooms with an average classroom lecturer to student ratio of 1:25 to ensure personal attention. These are air-conditioned rooms equipped for you to do your coursework in between classes. You may use your laptop here as it is a Wi-Fi spot and is also equipped with electrical points. art facilities that rival renowned hotels. We have the finest hospitality training facilities in the industry which includes Western, Asian, Cold, Pastry and Bakery kitchens, a 100-seater training restaurant, a bar and a 5-star mock hotel room and front office reception. The President hall is a purpose-built sports complex that houses a fully-equipped gymnasium and indoor courts. The hall is also used for extra-curricular activities such as dance, yoga, aerobic etc classes. Besides this, it serves as a venue for the university graduation ceremony and events such as Talent Nights, Dance and Drama competitions and many more. 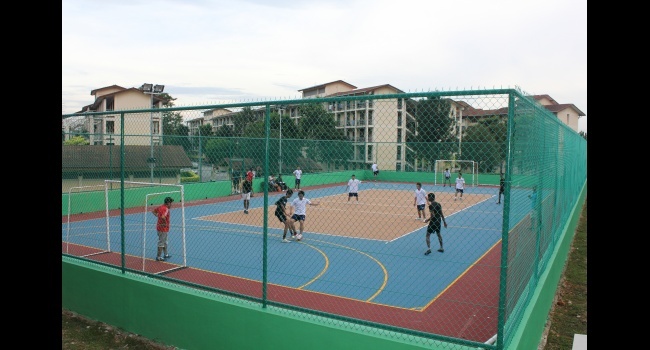 There are numerous outdoor courts for tennis, badminton, volleyball, basketball etc spread over Nilai University’s 105-acre campus. There are also ample lawns for you to enjoy a game of Frisbee or any other sport you fancy. Street soccer and cricket are some of the latest additions to the list of game facilities available on campus. Nilai U is one of the few universities with a lakeside jogging track. It’s the perfect venue for a barbeque and games. Which other campus allows you to enjoy a 27-hole golf game and an Olympic-sized swimming pool. At Nilai U, enjoy these facilities at Nilai University’s sister-company Nilai Springs Golf and Country Club which is just 5-minutes away. (Free shuttle service provided). Food on campus is never a problem. Get your breakfasts, lunches right up to your midnight snacks at our 1,000-seat food court. A wholesome and affordable range of Malay, Chinese, Indian and Western food are available here. A trendy and modern café which serves a variety of pastry, cakes, breads and sandwiches. It’s a popular place to chill out after a long day of classes with a game of pool or foosball whilst enjoying some MTV. Daily service timetable to key student destinations such as Komuter (train) station, Nilai Springs Golf and Country Club and the off-campus accommodation. If your family income is RM4,000 or below, you are eligible for the Education For All Financial with terms and conditions. Please see attached files for the details. You need only pay a non-refundable fee of RM650 and the rest of your fees will be cover under the PTPN Loan. Any extra tuition fees not covered by the PTPN Loan is waived by Nilai University. You must only apply for the diploma or degree programmes as the PTPN Loan does not cover Foundation courses so the EFA does not cover Foundation. The EFA is not applicable for the Diploma in Aircraft Maintenance as well. To apply you must fill up the Application Form, the EFA Form, provide 1 certified copy of the SPM/STPM/UEC results and parents’ 3 months salary slips, BE and J Forms.